For easy booking of up to 10 (or more) periods per day in up to 10 (or more) computer rooms (or other resources) by staff themselves across a network. The year can be divided into 1-6 terms or 4 seasons. You can easily customise it for use by any establishment and any language at the click of a few buttons. Once set up this software will practically run by itself. When changes are needed it is very easy to manage via the many intuitive tools and wizards provided. See fully illustrated details and very comprehensive instructions. Customise and configure easily with the intuitive management procedures. Insert your own title, establishment's name, logo and photograph. Configure up to 10 (or more) computer rooms (or other resources). Insert your own room/resource labels. Write your own information for the user about each room or other resource. 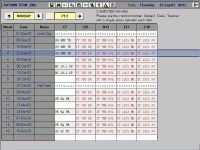 Configure up to 10 (or more) periods per day. Insert your own labels for each period (P1, P3/4, Lunch, Twilight, 9-10am). Customise on-screen instructions, entry validation rules and help-button texts. Covers an optional 5, 6 or 7-day week. Divide the year into separate modules to cover from 1-6 terms or perhaps 4 seasons (for non-academic establishments). 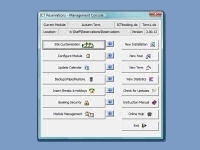 Configure to suit any timetable or calendar requirements, including 2-week timetables. Insert relevant notes for each day (Training Day, Bank Holiday, Y7 Exams). Configure up to 6 modules to provide advanced bookings, each for up to 10 rooms, laptop trolleys or resources such as projectors and cameras. Many user functions - cut, copy, paste, undo, fill column, find and replace. Hyperlink to own web-based school calendar to check for events or use it for any other web address. Hyperlink to web-based fault reporting included with package. Quick view buttons to enable printing of timetables for today, tomorrow, selected week, or for each room or resource. 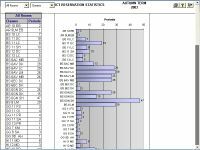 Create statistics table and bar chart to show usage for your reports. Instant on-screen help for all management tasks at the touch of a button. Selectively or globally lock/unlock/delete bookings at the start of each term. Lockdown option to deter block booking too far in advance and option to lock all bookings daily. Customise all text seen by the end-user. Language sets for many European languages - Dutch, French, German, Italian, Norwegian, Spanish, Welsh. Easy to edit and add new languages. Editable text labels for all menu buttons. Unwanted buttons can be temporarily deactivated by removing labels. Automatic installation program that preserves all existing links, configuration details and bookings when upgrading. Other users listed before entering management mode (which disconnects them). A scheduled task procedure that can be used to perform four functions: 1) Remove any temporary files created during normal use by Excel; 2) Remove temporary user data that causes the booking file to grow bigger whilst in shared use; 3) Keep the optional 'lock down after so many weeks' function moving forward in time; 4) Perform the option to lock all existing bookings. Backup and restore functions for both booking data and configuration settings. Adapts to all screen resolutions. Quick filling in of block bookings and holidays. Wizards to help setting up during first installation and at the start of a new term or new year. Search & wipe management facility to search for a booking or part of a booking and delete all those found between the selected dates. Useful for late announcements of Year 11 study leave, work experience, etc.. You can also delete all bookings between selected dates - useful if your normal timetable is suspended for an activities week. 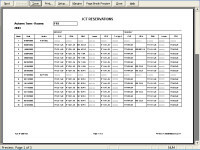 Import room bookings and calendar events using a spreadsheet file exported from your timetable software, such as Sims.net or NovaT. Editable pop-up calendar calculates and shows annual events, holidays, etc.. 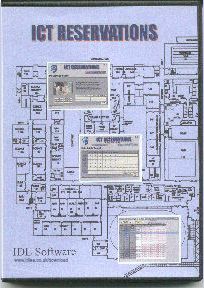 Initially this program was developed in 2001 for use in my own school, where I have been Head of ICT since 1986 and more recently the IT Systems Manager. New management tools and other refinements are continuously being added. These arise both as a result of my own needs and upon requests from other schools, colleges and non-academic establishments who are using the program. STANDARD DISCLAIMER: You may use and apply the information provided on this page only for the intended purpose. The author does not accept legal responsibility for the contents of this page or for any effects that the use of the software provided may have on your computer system.